This C13 Y-cable lets you plug multiple devices into a single power outlet, to maximize the space on your power strip, surge protector or wall outlet. It’s perfect for setting up dual monitor arms. The cable length from the Y-split is 30 inches on each side. This gives you an extended reach for connecting to two monitors securely, without placing a strain on the cable. 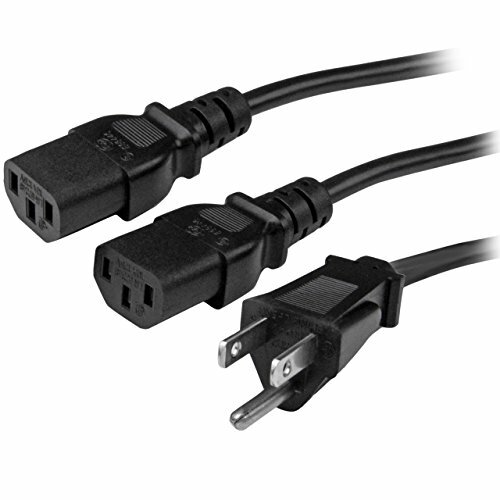 You can also use the power-splitter cable to connect a monitor and computer, or any two devices that have a C13 power connection, to the same outlet. The PXT101Y10 is built to exact specifications and is fully tested to ensure maximum performance. Plus, the cable is backed by a StarTech.com lifetime warranty for guaranteed reliability.